Today, 21st April, 2012, as I stepped into my room, I discovered that I had a missed call on one of my mobile lines. This missed call happened to be from a foreign number (+4238773326 ). In my usual manner of returning every missed call, I simply did same in this scenario. However, after the call got connected, I heard this computerized voice on the other end, telling me that I had won $50,000 and I should follow the voice prompts in order to claim my cash. At This Point, I Knew It Was A Scam. Anyway, I decided to see how far they would go and I stayed on for a little longer. The computerized voice at the other end, said, " We would need your personal details in order for you to claim your price" and then it went ahead to say " If you are a Male, press 1, if you are a female, press 2"; I played along with that part and then it moved on to "Please pronounce your full name audibly after the beep......"; At this point, I had enough and simply hung up. "Your cheque of $50000 will be given to another winner if you don call for free now on this number 004238773326"
"urgent: The last chances to receive your gift call immediatly this number or your gift will be given to another person004238773326"
I must say that this is a new scamming technique of which though very easy to tell, however, many might fall prey. As an information technology expert, even though I did not follow through to the end of the call, however, I can confidently guess that these scammers are aiming to get enough personal details as they can get from individuals and then they would then use these acquired details for identity impersonation leading to theft and all sort of vices aimed at defrauding their unsuspecting victim. 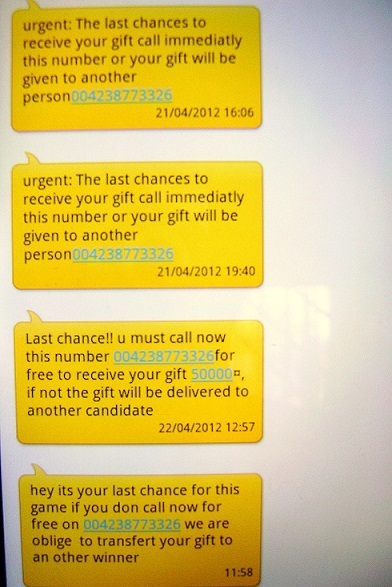 This is my message to all, DO NOT GIVE OUT YOUR PERSONAL DETAILS TO THIS NUMBER ( 423-877-3326 ), IT'S IS A SCAM! If you received a call from this number, kindly feel free to share your experience below in the comments area. Thanks Eta. I received a call from this number yesterday and everything you said above was exactly what happened to me. However, I unknowingly did as they requested. Now I can see that my greed played on me. I hope they do not do anything silly with my information that I gave. Thanks for this Eta. I missed their call as well and would have called back, except that I had exhausted my my contract with my mobile operator. Now I know that I shouldn't bother anymore. o also received a call from them and i knew it was a scam so i didnt reply.....but the've been troubling me with sms!....i wish i could just nab them! My inbox is just full of these guys. What a nuisance. I pray they are caught asap. Thanks so much for this Eta. God Bless. This really helped. These guys do not own a network of their own. Therefore I am sure that this call is originating from a network somewhere in the world. This guys should be tracked down menh. So this is now their new game in time. Thought I was the only one these guys were harassing.